Summary: Humanzee. What is it? Is it a chimpanzee? A human? Perhaps it is a hybrid of the two. According to many evolutionary proponents, the humanzee is more than just a creature. This hypothetical mixture of human and chimpanzee genes is a great hope to validate the ideological premise that humans and chimpanzees share a common ancestor. This premise is in defiance of God’s Holy Word, which holds that humans were created in the image of God, and given dominion over animals including the chimpanzee. To evolutionists, finding some way to prove that this is a possibility—that humans and apes can interbreed—is the pathway to legitimacy. However, history is littered with their failed attempts to prove such ridiculous claims. In the 1920s, atheism found a perfect candidate to prove that humans and apes were related through crossbreeding. In the May 2009 issue of Acts and Facts, a biologist named Ilya Ivanov was described as a world-class specialist in the process of artificial insemination.1 If anyone could produce a hybrid offspring, he would surely be the one. And so, funded by the Soviet Union, Ivanov set out on his experiments. Indeed, hope springs eternal. And in the 1960s and 70s, the belief in the elusive humanzee received another shot in the arm. His name was Oliver. Oliver was an odd creature who seemed to be a chimpanzee, but who exhibited odd characteristics such as walking upright and a lack of facial hair.3 He did look somewhat more like a human—not that chimps don’t already look similar to humans on some level. But evolutionists claimed that he was a hybrid—the offspring of a human-chimpanzee relationship. Some even claimed he had 47 chromosomes, instead of 46 like a human, or 48 like a chimp. 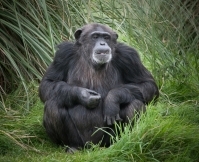 However, in spite of the level of hype evolutionists and atheists were able to drum up, real science eventually got to work and demonstrated that Oliver was simply an odd chimpanzee with 48 chromosomes as would be expected of any chimp.4 Even though he acted and looked different, he was still an ape. Oliver had failed the evolutionists. Yet evolutionists and atheists today still parrot the idea that a humanzee is a very real possibility, because they refuse to allow science to influence their views of reality. In fact, many even claim that Oliver is still evidence enough of a relationship between humans and apes. They claim that he is a mutant, whose similar appearance proves relation—even though no law of logic would support this idea. Similarities do not prove a relationship. But for atheists and evolutionists, the humanzee is not something to let go of, no matter how hard science tugs. For the humanzee is not a chimp named Oliver, or a test-tube baby from Ilya Ivanov’s lab. The humanzee does not exist. The humanzee is the twisted, unproven, unfounded fantasy of a deluded, evolutionary heart, blind to the reality of God’s Word and science. 1. Jerry Bergman. “Human-ape hybridization: A Failed Attempt to Prove Darwinism.” Acts and Facts (May 2009), pp. 12-13. 3. “The Story of Oliver.” Primarily Primates. http://www.primarilyprimates.org/videos/ppvid_Oliver.htm (accessed May 20, 2009).